The Bosch CLPK237A-181 18V Cordless Combo Kit provides tools that deliver the maximum amount of maneuverability plus power on a jobsite. This collection has two powerhouses that deliver top-flight muscle-to-weight ratio: the Bosch HDS181A Compact Tough 1/2 In. Hammer Drill/Driver and the Bosch 25618 1/4 In. Hex Impact Driver. The hammer drill/driver features Bosch's innovative canned motor, which is more compact but provides the same power as conventional 18V motors. It also has a heavy-duty chuck that prevents drill bits from slipping during high-torque applications, thanks to high clamping force. The impact driver is designed for professional driving jobs, supplying 1,500 In.-Lbs. of torque, 2,800 rpm and 3,200 bpm with a short 5.7 In. head-length. The included two 18V 4.0 Ah FatPack Batteries and an 18V charger ensure these tools run as long as the job takes. The DeWALT 1/4-inch 7.2V Cordless 2-Position Screwdriver Kit is ideal for lower torque repetitive fastening applications. World-class ergonomics provide the lightest, most comfortable cordless screwdrivers available, resulting in greater productivity. This tool offers 80 inch lbs. of maximum torque output for a superior power-to-weight ratio in a variety of fastening applications as well as an adjustable two-position handle that allows for operation as both in-line and pistol-grip. The industrial quick-release hex-shank chuck allows for quick screwdriver bit changes and prevents bit ''run-out'', while the variable speed and reversing trigger switch provides 0-500 RPM for fastening and pre-drilling into wood, plastic, and light-gauge metal. 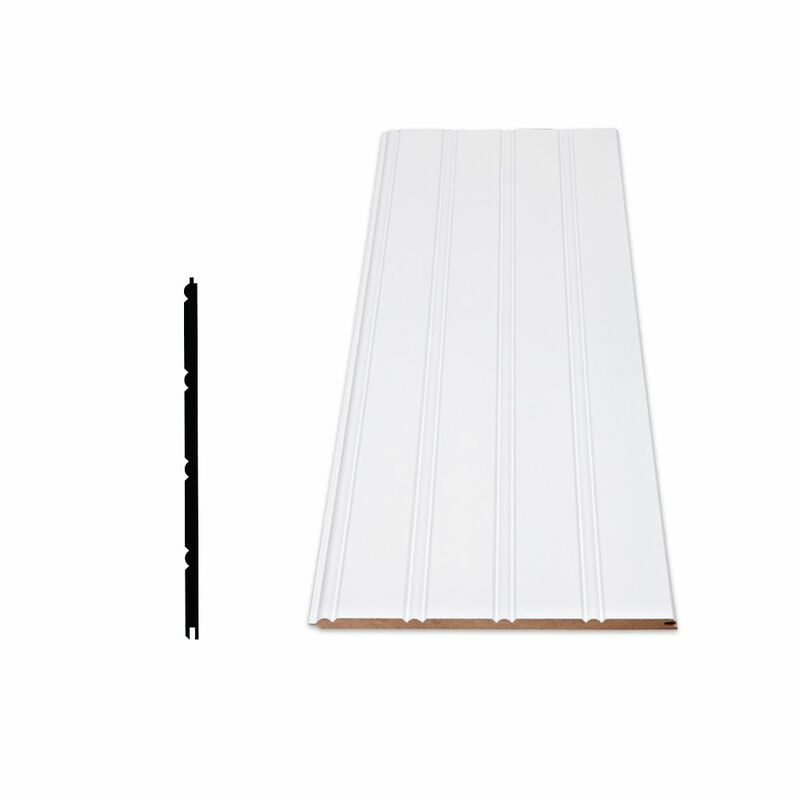 Primed Fiberboard Wainscot Kit - 3 Pieces Of 1/4 In. X 7 In. X 96 In. With an ancestry dating back to 19th century Victorian England, this classic wainscot design has outlived many other stylish fads. Beadboard wainscot is traditionally used in foyers, bathrooms, hallways and less formal gathering spaces of primary residences, cottages, and vacation homes. This easy to install wainscot system recreates this authentic look and feel in as little as several hours. Perfect for a weekend project idea! Primed Fiberboard Wainscot Kit - 3 Pieces Of 1/4 In. X 7 In. X 96 In. is rated 3.8 out of 5 by 4. Rated 5 out of 5 by Dave from Alexandria Moulting We have made several purchases of this for our cottage -- we did a entire ceiling and loved the look. Rated 5 out of 5 by Mike3891 from Great Product I just recently purchased over 100 SQF of this wainscot kit along with the chair rail and baseboard to go along with it. It all went smoothly and quickly. It certainly added a wow factor to my porch. Rated 4 out of 5 by shrynai from Easy to use I bought this a couple of years ago to change a closet into a mudroom. The product was easy to use and install. Rated 1 out of 5 by Emj76 from Horrible product!!! I bought this last week thinking there is nothing easier than tongue and groove to install. I couldn't have been more wrong. The way its stored in the store, every piece is bowed. The wainscot itself does fit together without a fight. Can this fiberboard wainscoting be glued directly to the wall? And if yes, what kind of glue should we use?